No party is complete without a cocktail! This Ginger Pear Martini recipe is one irresistible sipper! Raise your hand if you like to try new drinks. It’s no secret that I love a good martini as you can see here and here. I love to try new cocktails, but they can’t be too sweet, too strong, include anything coconut flavored….or be blue in color. I know, I’m high maintenance, but I blame it on Kevin. When you have a husband who is a master mixologist, it’s hard to find drinks that measure up to his standard. Kevin pours a good martini. 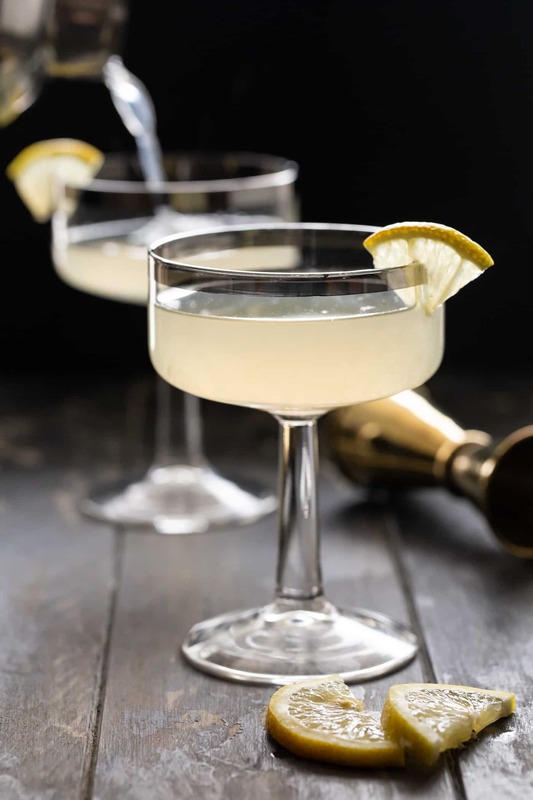 And this Ginger-Pear Martini recipe is one of the best we have. It’s still one of our most popular cocktails! What makes a Ginger Pear Martini so good? It checks a lot of boxes. It is smooth, crisp and refreshing. And not too sweet. In my eyes, that makes a perfect cocktail. 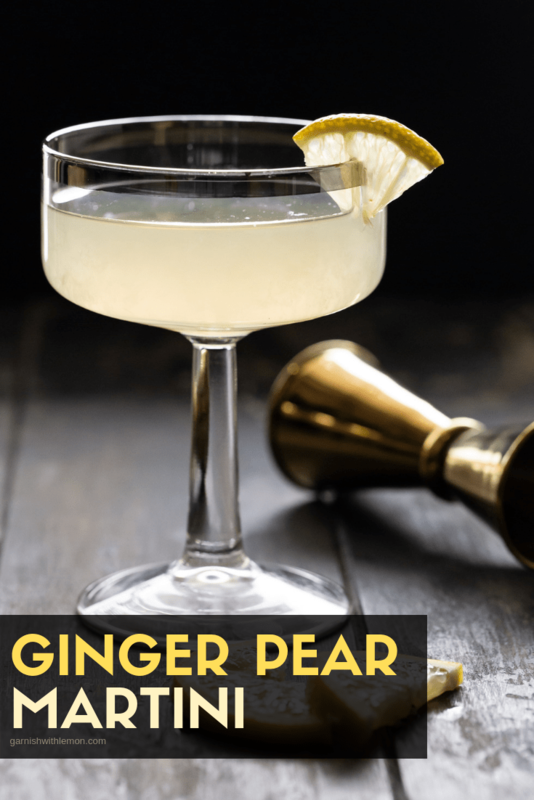 What ingredients do I need for this Ginger Pear Martini Recipe? The list is short so make sure your ingredients are the best! It starts with pear flavored vodka, a little ginger liqueur, some freshly squeezed lemon juice, and simple syrup. Assembly is simple. Shake it up with ice, pour in a martini glass, add a garnish of lemon and enjoy. How is that for easy and delicious? It all starts with the ingredients. Start with high-quality vodka and always use freshly squeezed lemon juice. Save the bottled stuff for another time. The difference is huge. Use the right equipment! This shaker is one of our favorites and is a workhorse in our home bar. Serve it in a pretty glass. Everything tastes better when it looks good. Tip: Hosting a party? Let your guests play bartender and set up a DIY Martini Bar. I promise it will be a huge hit! Try something new at happy hour tonight! 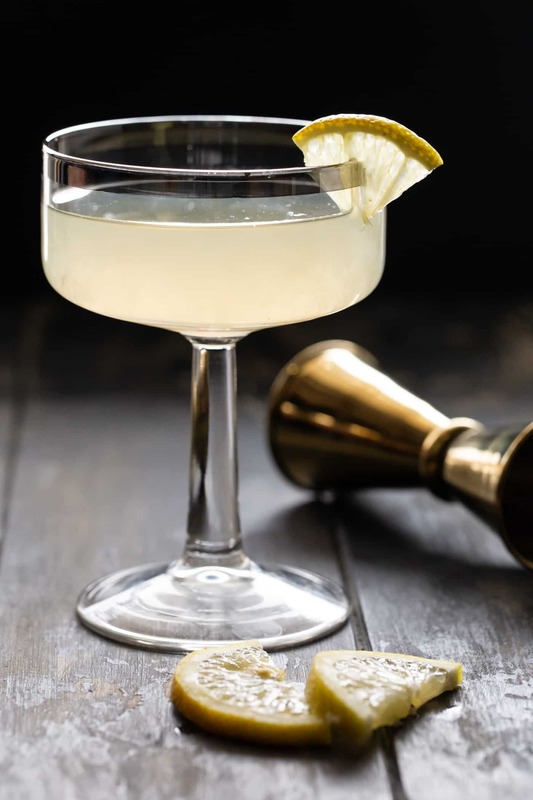 This Ginger Pear Martini is a delicious combination of ginger liqueur, pear vodka and fresh lemon juice. Place vodka through lemon juice in a cocktail shaker filled with ice. Shake vigorously to mix. 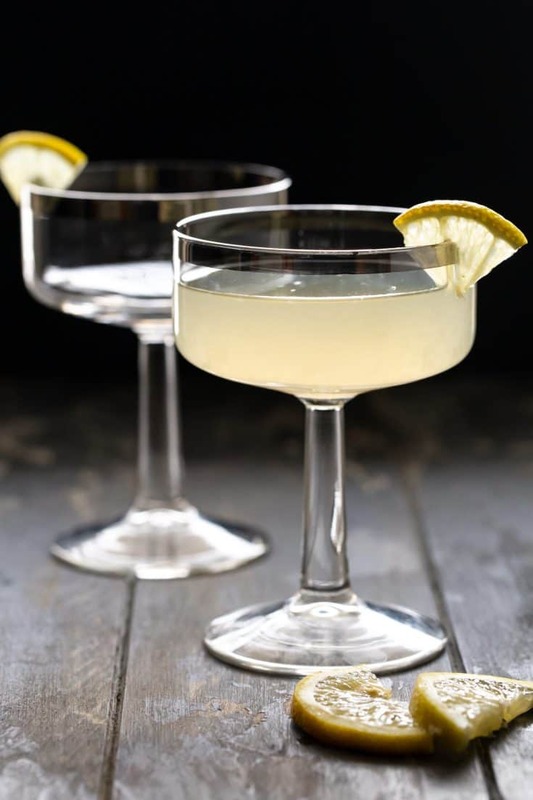 Strain into martini glass and add a lemon twist garnish. This was a wonderful drink that I will never forget – except that I served myself too many that wonderful night in 2011 and may have forgotten a few things. Yet, I was able to remember to keep making myself another… and another… and another. This is truly a winner!! You have a lot to live up to in 2012 – better get started. 🙂 Let me know if you need any help. Thanks Candice! We love it too! Looking forward to sharing the drink of 2012 with you! I am so excited to try this! I have been looking up a lot of martinis and this one definitely stands out. Thanks for posting! Thanks, Jayme! This is one of our favorites! Cheers! This is the BEST martini I have ever had!! Just the right amount of the right ingredients. Hmmmm, maybe I will have one tonight to toast my fabulous neighbors birthday!! This looks like my ideal cocktail – and it’s SO gorgeous! Thanks, Roxana! It’s definitely one of our favorites! I stumbled upon this recipe and made it tonight for date night. Wow! It is so good! I love ginger and have been trying to find a drink that isn’t a Moscow mule with ginger in it, but not overwhelmingly ginger and here it is. This may be my new go to drink. Thanks for sharing! It’s one of our favorites! Glad you enjoyed it! Thanks for being a Garnish with Lemon reader!